Private investors ended 2013 cautiously, turning net sellers of equities in the three months to the end of November for the first time since May 2012, according to the latest Private Investor Watch from Capita Asset Services. Until recently sentiment among private investors was very positive. As the stock market anticipated the UK’s economic revival, so private investors bought enthusiastically, adding a total £5.1bn to their holdings from June 2012 to August 2013. Most of that was in 2013, with a net £3.7bn in new investment in the nine months to the end of August. 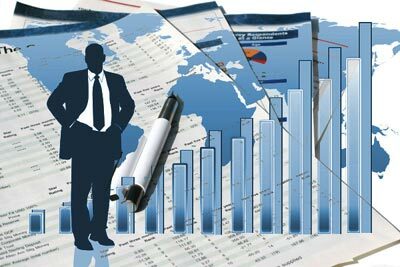 Since the economic news turned unambiguously positive, investors have become more circumspect, however. Since September, they have withdrawn a net £341m. This is only the third quarterly period of net selling in the last three years. It is however a modest reversal. The volume of selling this time is far smaller than the last round in 2011/12, when renewed economic uncertainty shook investor confidence. Private investors sold £1.5bn over nine months. 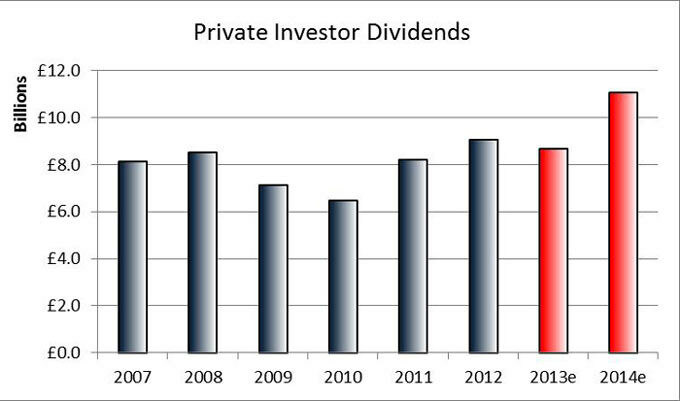 Dividends for private investors in 2013 will fall for the first time since 2010. For the full year, they will earn £8.7bn on their equity holdings, down from £9.0bn in 2012. This reflects a falling overall UK dividend pot in 2013 (based on Capita Asset Services’ forecast in the UK Dividend Monitor), and the fact that private investors own a slightly smaller slice of the UK equity pie than in 2012. Next year, private investors should reap a record £11.1bn in dividends. At the close of business on 17th December, private investors owned £214.3bn in equities, equivalent to 10.7% of the value of the UK market. Over the last twelve months, private investors have traded a total of £86.9bn in shares. This is slightly higher than in 2012 (£84.8bn). It means that private investors are holding individual stocks for 2.5 years on average. 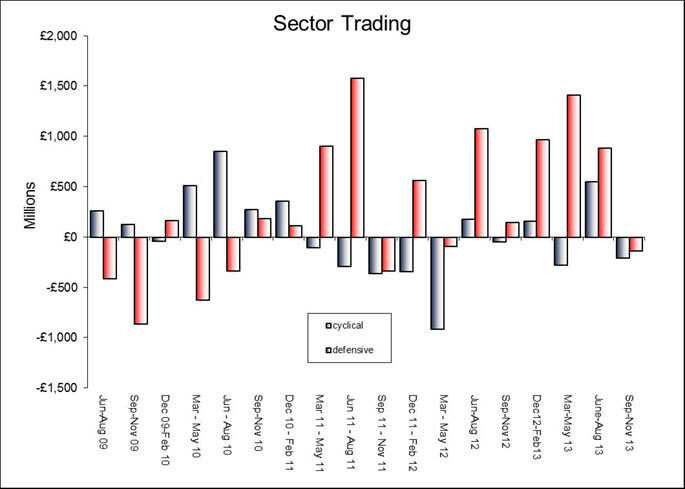 Since March 2011, private investors have been gradually refocusing their holdings towards stocks more sensitive to an economic upturn. 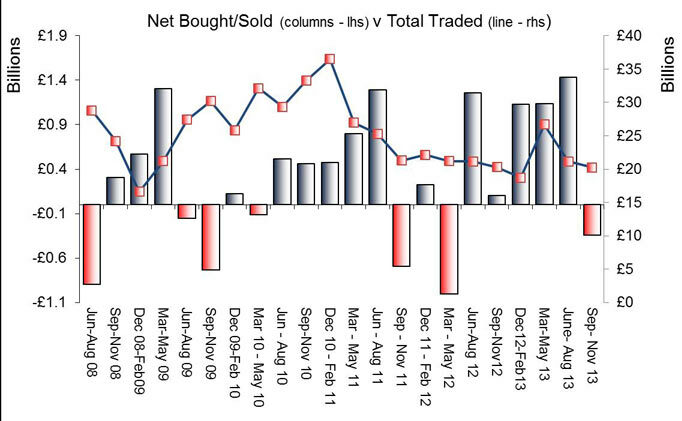 Even in periods of net selling, they have tended to sell less of these shares than of defensive counterparts. Before this time, the reverse was the case, with a focus on those companies best able to survive the economic downturn. In the last three months, even though they were net sellers after such a long break, the trend of favouring cyclical stocks continued; they sold £134m of these, but made much larger sales of defensive shares, a total of £207m. Justin Cooper, chief executive of Shareholder Solutions at Capita Asset Services said: ‘Private investors bought on the rumour of economic growth and have sold on the news. The FTSE All-Share is up 28% since the long buying spree began in June 2012, and 11% in the nine months to the end of August, but it has traded sideways since then. Retail investors have seen that as an opportunity to take some profit.